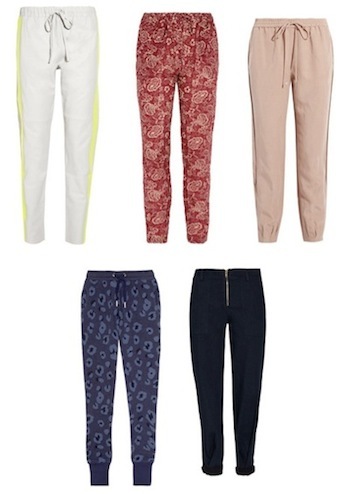 Add a little athletic chic to your wardrobe with the drawstring pant. Drawstring pants are a great alternative to the comfortable sweatpants that you’re used to putting on everyday. These days fashion designers are making tapered drawstring pants that look more put together and less schlumpy than the drawstring pants you sleep in. They come in many different colors and fabrics, such as silk, printed cottons and leather. I prefer to call them "track pants" as they have thick elastic on the waist band and ankle. Track pants are perfect for a growing pregnant body and are also great from day into night. Wear them during the day with a chunky sweater, some cool kicks and a leather jacket. For evening, throw on a romantic top with a blazer and mid-height heel. Add on and a statement necklace or fun pair of earrings and you'll have a sleek, contemporary night time look. These versatile pants can even be worn on vacation with a tank top, sandals and cute light weight scarf. Track pants are a fashionable take on the sports trend that is going on. You can even find stylish ones with alternating color stripes down the legs for a retro feel. To really take the track pant to the next level, pair it with this seasons hottest jacket: the bomber jacket. The casual silhouette is both easy and comfortable, and the drawstring waist makes them super laidback and relaxed. Whether you’re hanging out at home or out on the town these track pants are a fresh choice for Spring!